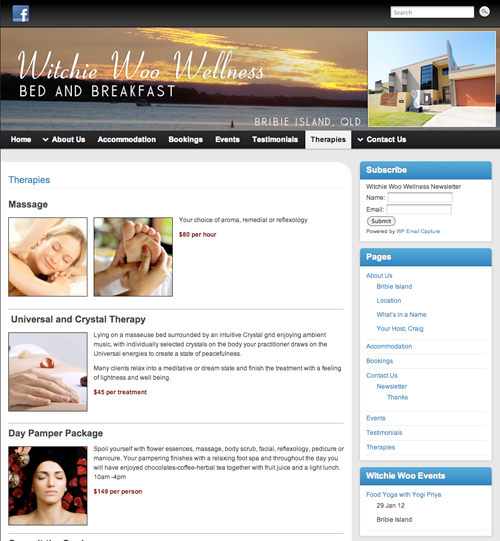 I recently finished designing and building a web site for the Witchie Woo Wellness B&B in Bribie. The retreat is Bribie Islands only 4.5star surfside ultra modern bed &breakfast offering you overnight stays together with short and long stay options. We pride ourselves on offering you access to many of the areas holistic practitioners at the most affordable prices. Wake to the sound of the surf and a continental breakfast of cereals, fruit, juice, coffee, teas and toast, before or after you leisurely stroll on the beach.